It's a new month, which means a fresh board to post our goals and PRs on. Did you know that you are nearly two times more likely to accomplish your goals when you write them down? So don't be shy! Don't forget to post those PRs as well. We love seeing all the progress! Double Unders - Conquer the Plastic! Hey CFMers. Let’s talk about body positioning for double unders. I know what you’re thinking: “Uggghh! I HATE DOUBLE UNDERS, and I’m sick of that rope kicking my A$$!” As a coach, I have to say I rather enjoy all the nice language I hear from you guys as you colorfully yell at your jump ropes during warm up and WODs. I never knew a few pieces of plastic could cause us so much pain and anguish. Well, I hope this post can supply you with a key tip to conquer the plastic! Far too often, I see you guys performing great singles with perfect hollow body position. Your elbows are close to your body. You’ve got fast rotation with the wrists. Your feet are together and punching off the ground through your toes. But then, you try a double under, and all that beautiful form goes out the window. Suddenly, I’m seeing donkey kicks and high school cheerleading tuck jumps. Your arms push out to your sides in a T-shape, and you’re crying from rope whips because it’s now too short to jump over. Thus, the hatred for double unders continues. So let’s focus on one thing at a time with conquering those double unders, and let’s start with body position. If you’ve spent some time in my classes, you’ve heard me say over and over how important the hollow body position is in CrossFit. 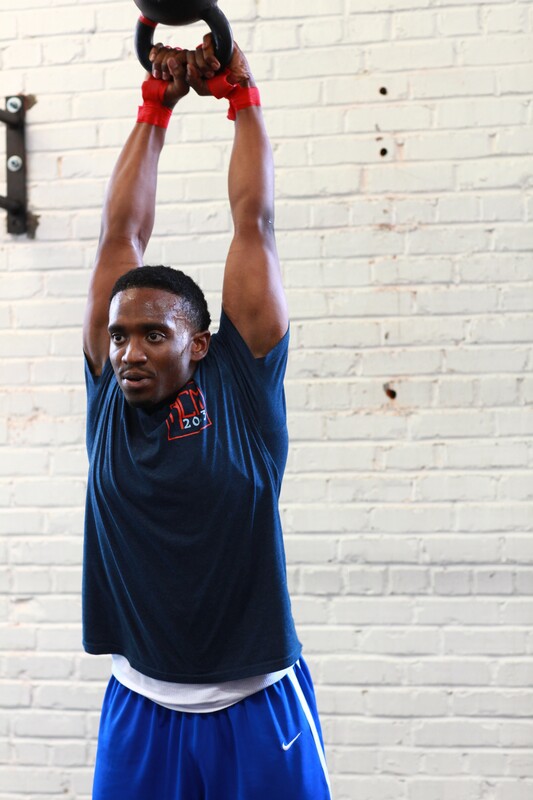 This one position, when mastered correctly and practiced often, translates perfectly to a ton of the CrossFit movements we see everyday in our WODs. And yes, the hollow body position is important to the double under as well. Stay focused on keeping the hollow body position during your jumps, and once you try your double under, do nothing differently except punch off the ground through your toes just a little bit higher. That’s it. Body position does not change. No donkeys. No cheerleaders. Just you, the hollow body position, and the rope. Bam! You got this! To see exactly what I mean, check out this video from Carl Paoli, guru of body position and movement theory. CFM students Shaylyn Blake and Joe Portera are participating in the Invesco Perpetual Lakes Adventure Race and you’re welcome to donate $5 towards the fundraising effort. The goal: To give young people the hope, confidence and life skills to meet the challenges in their lives and together build trust and motivation through a journey of experience, adventure and fun. The team has a fundraising target of 4,000 sterling. Happy belated birthday to Anna E! As someone new to Crossfit, you are often exposed to a number of terms and acronyms that you may not have seen before. One of these is the notion of Rx as it pertains to a workout. To “Rx a workout” means to do the workout as prescribed, or to do the movements in a certain manner at the assigned weight. It’s highly unlikely that you will be able to walk in off the street with no previous CrossFit experience and Rx all the workouts. Don’t view this as something negative. 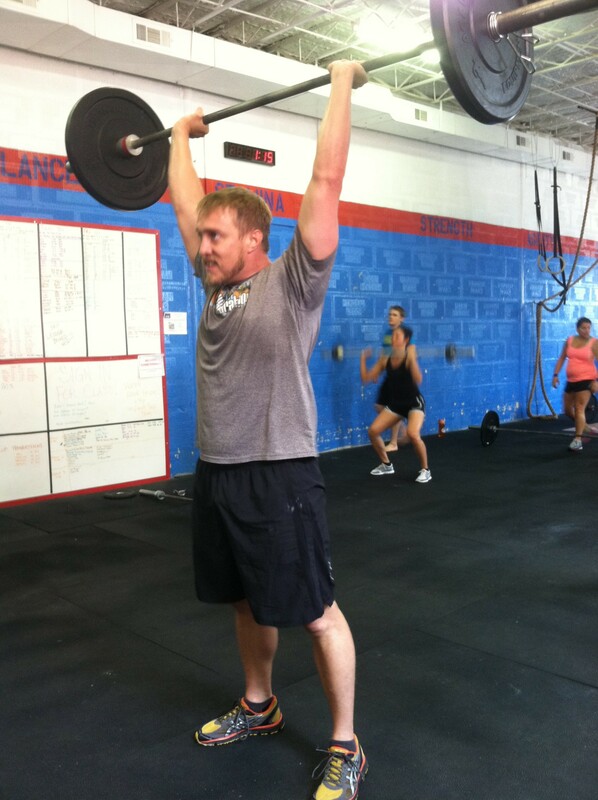 All workouts can be scaled, and that is one of most appealing aspects of doing Crossfit. If you scale appropriately, you will find yourself working and pushing yourself as hard as everyone else around you. The more you work at it, the more you’ll improve in form and strength. At the same time, remember to be realistic. Don’t try and Rx a workout where you lack in a certain skill just because you’ve started to do other workouts as prescribed. 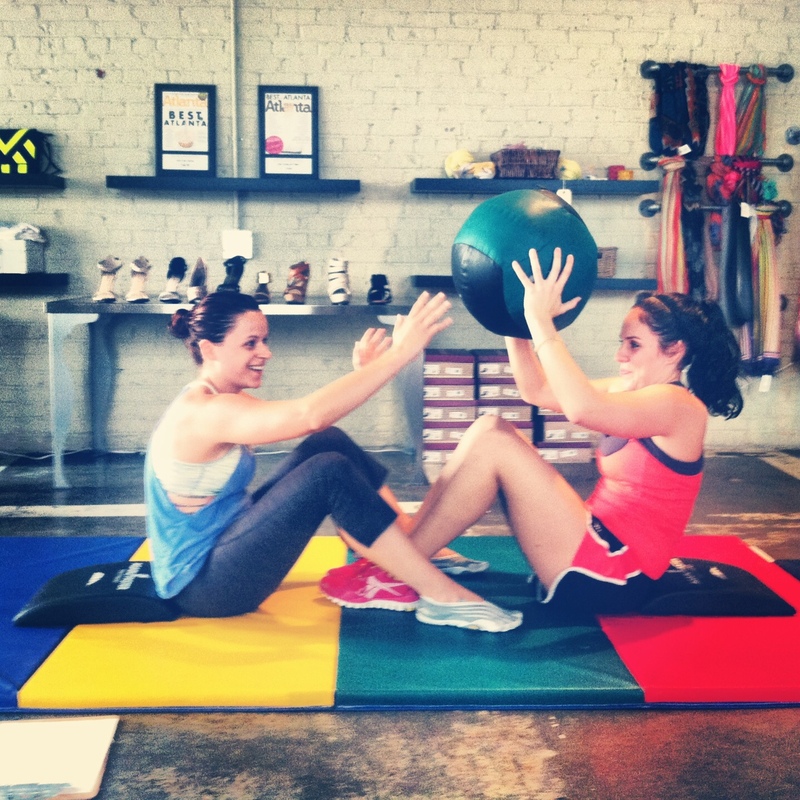 Focus on getting full range of motion on all movements, and decrease the weight if you are struggling. Proper form is essential for staying injury-free. Rx is great for goal setting and tracking your progress, but don’t let it be blinding. Avoid the mentality that you should always Rx a workout. At the same time, don’t put it on a pedestal as something you’ll never be able to achieve. Keep working hard and improving! And remember to record your workouts, so you can go back and see your progress. After party immediately following the workout! Ian meeting Fran for the first time a couple weeks ago. Once again CFM is participating in the 31 Heroes charity workout. This is a challenging workout to raise money for wounded soldiers and their families. The workout is a memorial to honor the 30 soldiers and 1 military working dog who died in Afghanistan on August 6, 2011 during an extraction effort when their Chinook military helicopter was downed. Cost: $31 (plus $6 shipping fee for your shirt - may be able to opt out of getting a shirt if you don't want to pay the extra 6 bucks). Scaling? : Yes, this workout is hard as hell. Any of the movements can and should be scaled depending on your skill level and capacity. Don't not sign up just because you're not comfortable doing it as written. The point is to honor those who have sacrificed for you, raise money for a great cause and to get a great workout with your friends. Post Workout Reward: Rex and I will have a cooler of free beers for finishers. Nothing like cooling down after a hard workout with a cold one and some good company. Hope to see you all on Saturday! 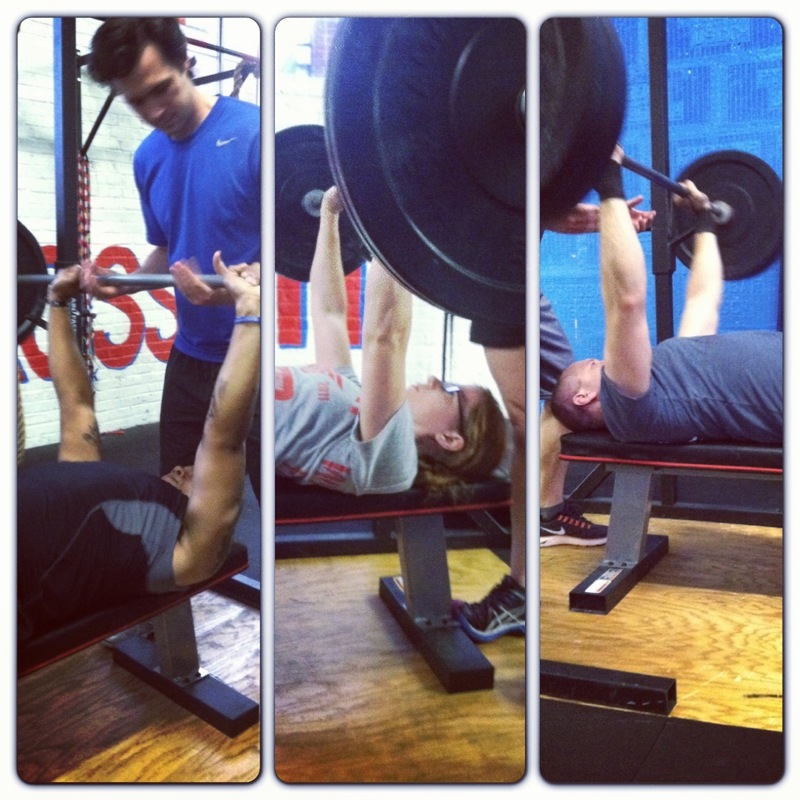 It was great to see all of those PRs set a couple weeks ago on 1 rep max bench press! 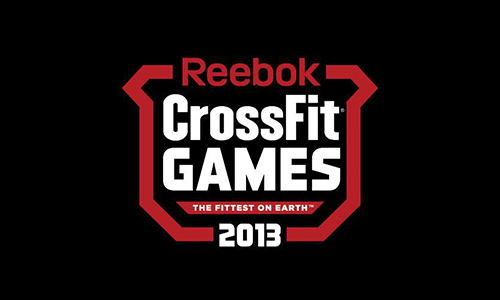 Today the 2013 CrossFit Games kick off at the StubHub Center in Carson, CA. Watch the events live and cheer on the Atlanta area athletes competing - Emily Friedman, Daniel Petro, Travis Mayer, ZA Anderson and teams from CrossFit Atlanta, CrossFit Adrenaline & CrossFit Rx. And see if you can spot Lis anywhere in the stands! View live coverage at ESPN3.COM. Make up a WOD you missed from progress checks this week. -How did you first get exposed to CrossFit? What made you try it? Saw the Special Forces teams doing it during deployments. Thought it was just a new fad but then kept hearing about it from my friend Stephanie that works at Outlaw crossfit in Alexandria, VA. Decided to give it a try and see what it was all about. -Take us back to your first WOD... what was it, and how did it feel? Something with deadlifts, pullups, and kettlebell swings. I thought I was in shape before, sure proved me wrong. Was licking the floor -- face melted. 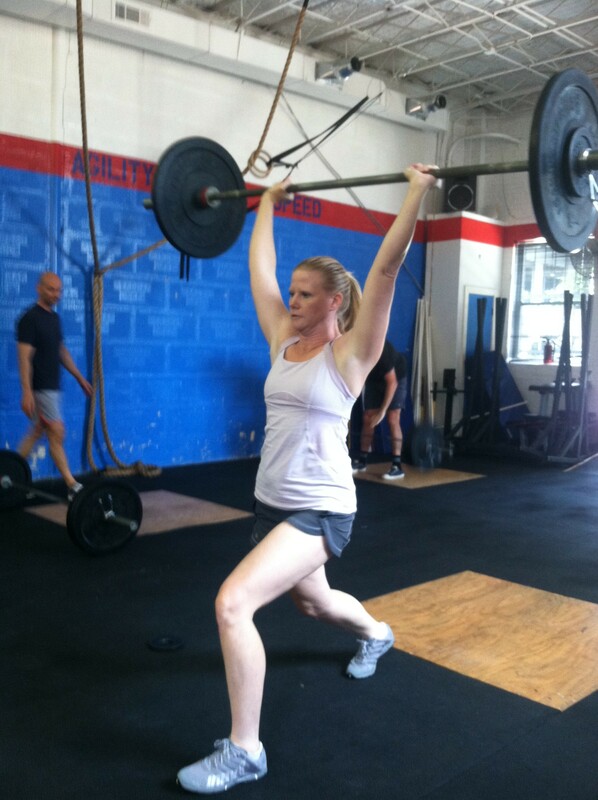 -Favorite WOD: Anything with double unders, handstands, or muscle ups. -Least Favorite WOD: Anything with deadlifts and rowing. -What sort of changes have you seen in your body, health and fitness since starting CF (before/after)? Changes and growth that used to take years now seen in months and weeks. -What sort of changes in your life have you experienced out of taking on something like CrossFit that were totally unexpected? Stopped caring about how I looked because I knew and body felt like it was getting amazing workouts. -Favorite CFM moments: Throwing on a 45# vest and getting a strict muscle up. -Any advice for people just getting started? Pick a skill that interests you and do it. Fall many times, get up and do it again. -Do you follow the paleo or primal lifestyle? What is your nutrition philosophy? My eating habits are very poor, unfortunately. -What did you eat today? West Egg Café, scrambled eggs, potatoes, sausage patties, short stack of chocolate chip pancakes. Come out and join us at Fab'rik on Wednesday nights at 6pm for Wine Down Wednesdays. Free workout and wine with friends...enough said! Here at CFM, we talk a lot about food. We strive to maintain a good balance of healthy fats, proteins, and carbohydrates, because no matter how hard you work in the gym, you can’t out train a bad diet. While it’s true that food is an integral part of your athletic performance, there are four macronutrients required for the body to maintain function: protein, carbohydrates, fats and water. Water is by far the most critical and resourceful macronutrient. Because our blood plasma is comprised of about 90% water, dehydration reduces the amount of blood in the body making our veins work harder to pump red blood cells and deliver the oxygen needed to sustain workouts. Dehydration also leads to a diminished amount of electrolytes, which can lead to a reduced work capacity and slower recovery time. Nobody wants that! Make sure you’re giving your body optimal conditions for performance during the workouts by staying hydrated. So how do you make sure you’re getting enough water? Well, you CANNOT rely on thirst as an indicator. By the time you have become thirsty, you’ve lost anywhere from 2-5 cups of water and your body is already suffering from dehydration. Try switching things up and drinking a big glass of water first thing in the morning before that daily cup of coffee. You’d be surprised how it “wakes up” your body and changes the way you feel throughout the day. You can also add water-dense foods to your diet such as celery, bell pepper, cucumbers and lettuces. Approximately 20-25% of our water consumption comes from food intake. And don’t forget about those combatting those cocktails! Keep in mind that alcohol dehydrates the body. Drinking water before, during and after alcohol consumption is key to making sure we can enjoy ourselves without affecting our performance. So forget the Dos Equis guy, and stay hydrated, my friends. Justin R did a great job with full range of motion during kettlebell swings in the Helen challenge prelims!